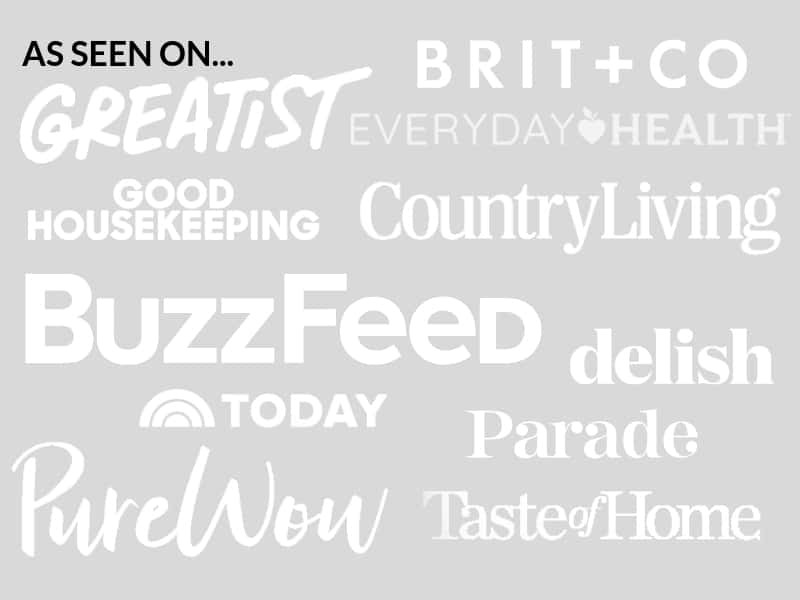 April 23, 2015 By Elizabeth Lindemann 3 Comments / This post may contain affiliate links. To a New Englander, there are very few things that are better than when spring finally arrives. And it’s HERE! FINALLY. After six months of cold (the kind of cold that hurts your face), of going to battle with the snow, of layers upon layers of clothing, of unspeakable heating bills, and of seeing nothing green, we are a people who welcome spring with open arms. At last! Open windows, light jackets (if any! ), and seeing things growing out of the ground! And the ground itself, not covered in snow! People outside, enjoying themselves! And the best part of spring- fresh green seasonal produce! Hurrah! It’s so easy to eat healthy this time of year with all the yummy, fresh, seasonal green things that abound in the spring. 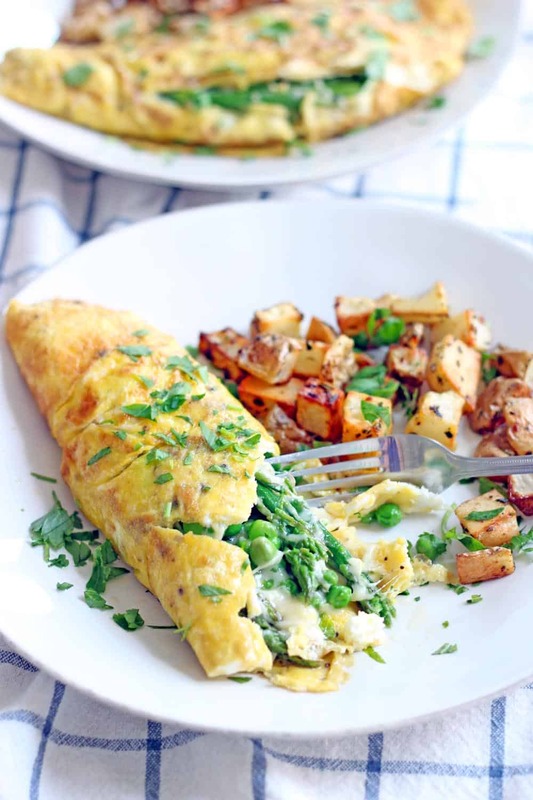 And this asparagus, pea, and gruyere spring omelette is the perfect way to get in a big dose of fresh delicious spring veggies for breakfast, lunch, or dinner. And it only takes a few minutes to make! YUM. I have to admit: I’m usually not the biggest omelette fan. I’ve always found them to be a bit dry, and the veggies/filling to not quite blend well together. This is because I’ve always had a scrambled omelette, rather than a rolled one! 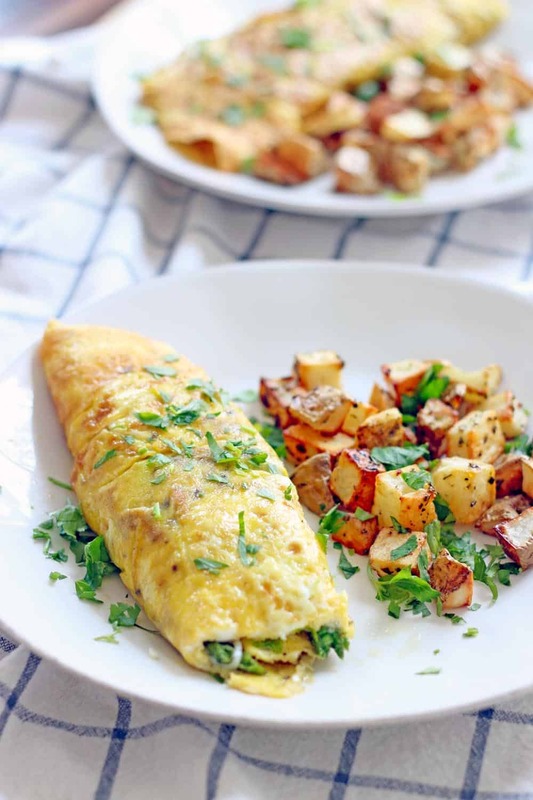 Rolled omelettes are the way to go.
. Julia Childs knew her omelettes, that’s for sure. A scrambled omelette is just what it sounds like- you cook eggs and mix the filling into it, like scrambled eggs (but a little more put-together). 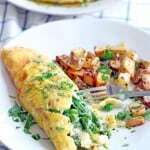 For a rolled omelette, the eggs are cooked like a big pancake in a skillet, the fillings are added on top, and the eggs are rolled around the filling, like a tortilla. BIG DIFFERENCE between the two. This was absolutely delicious! The outside is somewhat crispy, the inside creamy, and the veggies are perfectly cooked and stand out on their own. This omelette is made in two parts. while I prepped my other ingredients. (this is VERY important- it won’t work in a cast iron or steel skillet, much as I love them) in a generous amount of butter. Heat the skillet and butter first until it’s very hot, then add the eggs. They will begin to cook almost immediately- lift up the edges of the eggs to allow some of the egg from the top to slide underneath until the eggs are almost cooked all the way. When the eggs are mostly cooked and the top is still undercooked, add the cheese, asparagus, and peas on one side of the eggs and, using a spatula or wooden spoon, roll the egg around the fillings and transfer to a plate. Don’t worry- the remaining uncooked egg will cook through from the heat of the rest of the eggs. This ensures that the whole thing won’t be too dry. 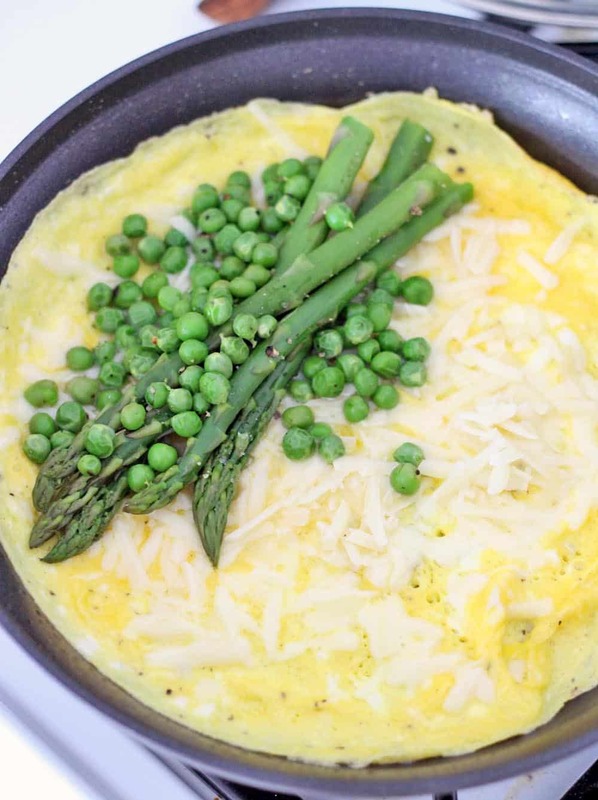 This asparagus, pea, and gruyere omelette is filled with healthy, fresh spring produce- it's a great way to get a big dose of green veggies for breakfast, lunch, or dinner! Steam the asparagus and peas together for 5-7 minutes, or until tender. Meanwhile, beat the eggs in a small bowl with salt and pepper. Melt butter in nonstick skillet over high heat and swirl to coat the bottom and sides of the skillet completely. Once butter has fully melted and is starting the brown slightly, add the eggs to the skillet. Lift the edges of the eggs up to allow the uncooked egg to slide underneath, then allow to sit for 1-2 minutes until eggs are almost all the way cooked. At this point, add the gruyere to the entire surface of the eggs, and the peas and asparagus to one side of the eggs, with another pinch of salt and pepper. Using a wooden spoon or spatula, gently roll the eggs around the fillings and then transfer to a plate, trying to place the seam side down.